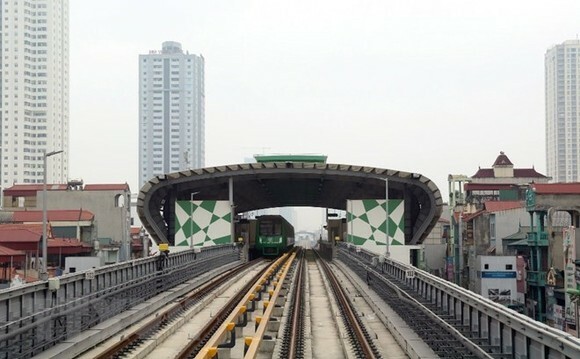 The Cat Linh-Ha Dong elevated railway line, the first of its kind in the capital city of Hanoi, will start its test run on September 2, the project management board said on March 30. The trial operation is expected to last between three and six months. Construction will be wrapped up in the fourth quarter of this year. The Cat Linh-Ha Dong elevated railway project with 12 stations and one depot area has investment of 868 million USD sourced by official development assistance loans from China. The railway project has 12 trains, including 48 carriages. Each train with four carriages can carry 1,200 passengers. The 13 kilometre railway is set to operate trains with carrier frequency of every two minutes and a maximum speed of 80 kilometres per hour.